Thursday, January 28 is National Kazoo Day! Below are a few activities and resources to share this fun day with students. Short inquiry activity: Share a blank Google Doc or note taking organizer with small groups or the whole class. Have students practice their database and web search skills to find and share information about kazoos. Remind students to cite their sources! Note taking practice: Have students watch the video A Brief History of the Kazoo. Using a blank sheet of paper or a graphic organizer, students document important information as they watch the video. Take this a step further by having students note the video time when important ideas are stated. Take a stand! After reviewing the material on Kazoo America, ask students to persuade others to vote for or against the Kazoo as the national instrument. Students can write essays, draw posters, or create videos. Patents: Explore the patent for the kazoo. What's a patent? How is it described? Are there any supporting materials? Are there any recent patents that reference this one? PBS Learning Media shares a simple straw kazoo activity and video guide. Zoom's Pitch: Straw Kazoo demonstrates how to make a kazoo and investigates how a kazoo makes sound. How A Kazoo Makes Sounds activity at Education.com allows students to experiment with different materials in making a kazoo. Growing Sound shares how to make a Carrot Kazoo. This can lead to a discussion of what other foods might make good instruments! Bill Nye (the Science Guy) shares how to make a Tube Kazoo. The New York Philharmonic Kids website has a great activity to Make Your own Kazoos and Flazoots! 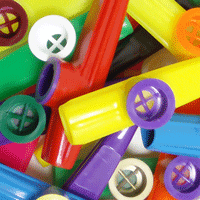 Read this fun article from Mental Floss that explores the Great Moments in Kazoo History. Visit the official website for the Kazoo Museum in Beaufort, South Carolina.